Enjoy dry, warm comfort from your work boot all day long, no matter where you work, with the Bogs Classic Ultra High Waterproof Boot for men. 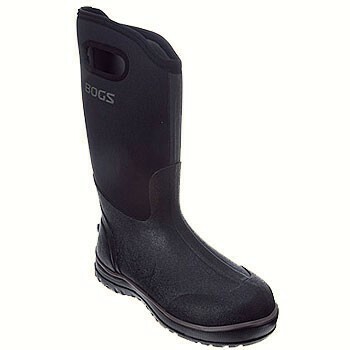 This 15.5'' boot features a 7mm SBR/CR rubber foam insulation, four-way stretch upper over an EVA contoured sockliner with Aegis anti-microbial technology that provides 100% waterproofing and warmth, even in sub-zero temperatures. Ultra High boots also feature handles built into the upper to help you slip boots on. Patterned rubber overlays protect your feet from scrapes and the elements. Non-marking, non-slip outsole delivers traction, even on slippery surfaces. We ordered a US 10.5 and it was true to size. Boots look sleek and strong. These are prefect for someone commuting on foot in cold, icy weather.